Bhai Jinda And Sukha Assasinate Congress Leader Arjan Dass At His Office In Delhi. 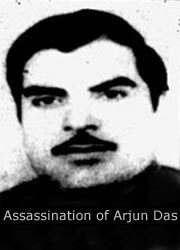 Congress leader Arjun Dass was assassinated on 4 Sep 1985 by Jinda, Sukha and one other Sikh because of his involvement in 1984 Anti-Sikh riots. Arjan Dass’s name appeared in various affidavits submitted by innocent Sikh victims to Nanavati Commission which was headed by Justice G.T. Nanavati, retired Judge of the Supreme Court of India. He was also identified among organisers of the carnage. Arjun Dass was a close friend of Prime Minister of India Rajiv Gandhi. This Dusht Was Responsible For The 1984 Sikh Genocide.